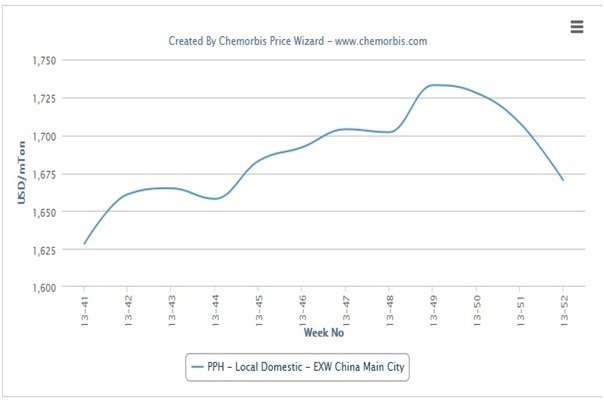 In China, local PP prices retreated back to early November levels as an extended rising trend from late April to early December lost speed as per the pricing service of ChemOrbis. Limited demand in the final month ahead of the Chinese New Year holidays was cited as the reason behind softer local PP prices. In addition, spot propylene prices on an FOB Korea basis declined by $25/ton at the beginning of the week due to weaker demand as Chinese buyers elected to purchase local cargoes at competitive levels instead of imports. 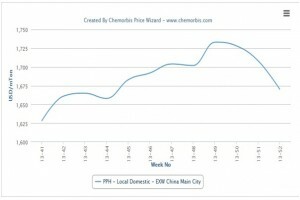 According to data from ChemOrbis Price Index, domestic homo-PP prices on an ex-warehouse China basis have declined by over $60/ton since the first week of December, when prices reached their peak. Locally-held PP prices posted decreases between CNY50-350/ton ($8-58/ton) week over week.